How Often Do I Pump My Septic System? Well this is a tricky question to answer because there are so many variables. How many people in your home, how old is the system and so on. The general rule of thumb is 3-5 years. This table (BELOW) will give you a good sense of how often to pump your septic tank or cesspool based on your personal situation. These pages are very helpful and apply to all septic situations in the Commonwealth of Massachusetts. It is always good to review septic info from the state you have your septic sytem located. Here is a very basic diagram to show you how your septic system works, there are many types of septic systems but this is the most common and gives a good idea of how they work and serve our households. Proper care and maintenance will result in many years of service from your septic system, most importantly we will ensure the protection of our environment and our groundwater supply. 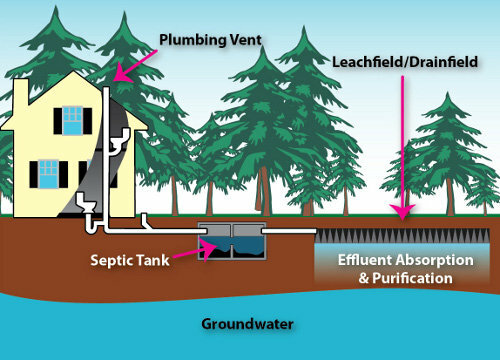 This is a helpful diagram of how the septic tank works, in short the tank acts as a sedimentation chamber, allowing household solids to settle and the clarified effluent or wastewater to pass on to the leaching field for treatment and disposal. When pumping a septic tank it is critical to remove all SCUM and SLUDGE. By performing regular maintenance you greatly reduce the contamination of your leaching field, if you don't pump often enough solids will clogg your leaching field requiring costly replacement. It is very important that the interior of the tank be inspected after pumping, all baffles, filters and other tank components must be checked to ensure proper tank functionality. During septic tank pumping all filters must be cleaned and their gaskets checked, filters ensure that the solids stay in the tank, protecting your leaching area. Copyright 2014 D & G Septic Tank Service. All rights reserved.